Magnesium supports calcium usage in the body. It is essential in the production and release of energy. No preservatives added. No lactose. No artificial color or flavor. No gluten. AllegroMedical.com presents The Sunmark Natural Magnesium Supplement. 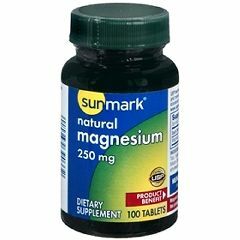 sunmark Natural Magnesium Tablets. 250 mg. Dietary supplement. Magnesium supports calcium usage in the body. It is essential in the production and release of energy. No preservatives added. No lactose. No artificial color or flavor. No gluten. Ingredients Per Tablet: Magnesium 250 mg; Magnesium Oxide; Cellulose; Talc; Sodium Starch Glycolate; Corn Starch; Silicon Dioxide; Croscarmellose Sodium; Polyethylene Glycol; Kelp; Magnesium Stearate. Not made with natural rubber latex. Packaged: 100 Per Bottle.